Updated Thursday January 14, 2016 by Louisiana Dixie Youth Baseball. Louisiana Dixie Youth has accepted the STATE OPTION on the New Bat Rule for 2015. In 2015 the 2 5/8" bat will NOT BE ALLOWED in Louisiana Dixie Youth League play except for O-Zone Play. The 2 5/8" bats will be allowed if your All Star Teams quaifiy for the State or Regional Tournament in Majors 12, AAA 10 and Machine Pitch 8. All other leagues will continue to use the 2 1/4" approved Dixie Youth Bats. If you have any question about his rule please contact your State, National or District Directors. 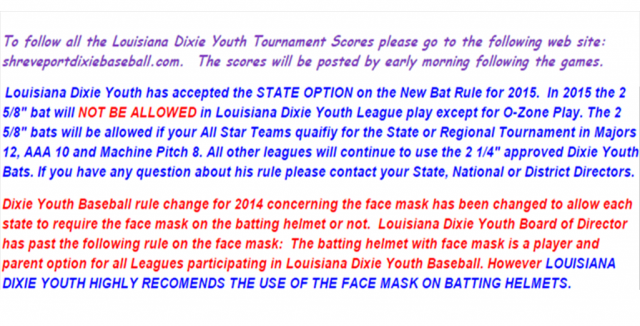 Dixie Youth Baseball rule change for 2014 concerning the face mask has been changed to allow each state to require the face mask on the batting helmet or not. Louisiana Dixie Youth Board of Director has past the following rule on the face mask: The batting helmet with face mask is a player and parent option for all Leagues participating in Louisiana Dixie Youth Baseball. However LOUISIANA DIXIE YOUTH HIGHLY RECOMENDS THE USE OF THE FACE MASK ON BATTING HELMETS. External links are provided for reference purposes. Louisiana Dixie Youth Baseball is not responsible for the content of external Internet sites. Copyright Louisiana Dixie Youth Baseball All rights Reserved.